Last month, hundreds of paper connoisseurs descended on New York for a convention put on by OrigamiUSA, in celebration of the delicate paper arts of East Asia. The event underscores the West’s growing appreciation for this time-tested art form. For most, origami (literally, “folding paper”, sans scissors and glue) invokes the quintessential image of a neatly creased crane. A level above this reveals models of other creatures and plants – elephants, flowers, sharks, and scaly dragons, to name a few. However, a quick look online suggests that these more conventional designs are the tip of the iceberg for the 17th century art form. While Japan is most closely associated with the pulp arts, there is evidence that the Chinese were known to fold paper for art’s sake – as well as burn paper representations of gold nuggets (yuanbao) during funerals. Even European countries Germany, Italy and Spain have their own paper folding traditions traceable to the Moors. But Japan is where the art form really found its home. “Origami is alive and well in Japan,” Leyla Torres of OrigamiUSA and Origami Spirit told The Diplomat. “There are origami clubs or societies in many parts of Japan.” Among them are the two main associations, the Japan Origami Academic Society (JOAS), formed to cater to the mainly younger proponents of advanced technical folding, and the Nippon Origami Association, which regularly publishes an origami magazine. While Japan has always been the heart of origami culture, in the 20th century the art was internationalized by a cadre of trailblazers and virtuosos from both Japan and abroad who pushed origami’s boundaries and took it in exciting new directions. Alongside Yoshizawa, Torres added the names of artists from Europe and the Americas, such as Miguel de Unamuno and Vicente Solórzano (Spain), Ligia Montoya (Argentina), and Neal Elias and Fred Rohm (U.S.). She also emphasized the influence of the diagramming system co-created by Yoshizawa, Samuel Randlett and Robert Harbin. Collectively, these artists took the simple act of shaping paper to mindboggling levels of complexity in some cases. Modern forms include no less than the following: icosahedrons; shapes that move, inflate, flap and fly; highly complex objects composed of numerous identical pieces fitted together (“modular origami”); gently curving designs made with dampened paper; miniature pieces that fit easily on a fingertip; and at the farthest end of the evolutionary spectrum, tessellations – many figures joined at the pleats, with no spaces between or overlapping parts. Some of the most complex examples of folded paper embody what appear to be – and often are in fact – mind-bending mathematical conundrums. Technical origami has picked up where the compass and straight-edge leave off, effectively doubling the cube (solving the Delian problem) and successfully pulling off angle trisection. Some examples of geometric madness in paper form by artist Kyla McCallum, exhibited in Glasgow this May, can be seen here. Other fantastic origami creation can be seen here, ranging from a tusked mammoth and a toilet made from a single dollar bill to a lemur and even a Minotaur. In terms of complexity, Torres recommended checking out the works of Robert Lang (US) and Satoshi Kamiya (Japan). An abbreviated list of some other notable contemporary artists named by Torres includes Kunihiko Kasahara (Japan – watch her teach how to build a 4D origami box here), Tomoko Fuse (Japan – well known for her modular origami work), Paul Jackson (Israel), Michael LaFosse (USA), Joseph Wu (Canada), Román Díaz (Uruguay), Angel Morollón (Spain), and author Jun Maekawa (Japan). 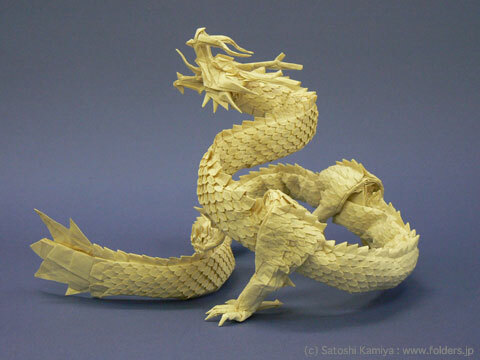 Pulp Art: Origami Unfolds in the West | Asia Life | The Diplomat.